New York (CNN Business)US crude oil fell below $50 a barrel Thursday for the first time in more than a year. Oil's recent slide has shaved more than a third off its price. Crude fell more than 1% Thursday to as low as $49.41 a barrel. The last time oil closed below $50 was in October 4, 2017. Investors are worried that US production is increasing as economic activity overseas slows. As the price of oil rose earlier this year, US shale oil production surged. The United States passed Saudi Arabia to become the world's largest oil producer. 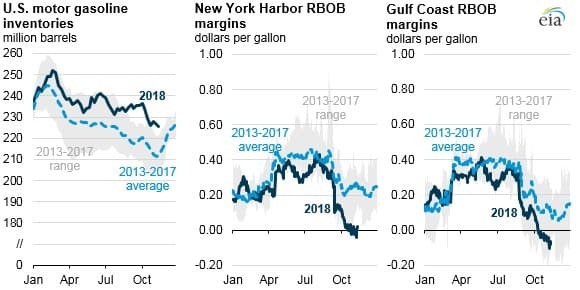 US gasoline prices have also started to fall. A gallon of gas dropping 30 cents on average over the past month, according to AAA. That's an 11% drop. In reality, Saudi Arabia is pushing hard for a deal. After several hours of closed door meetings, the OPEC delegates emerged without offering too much in the way of detail. Still, there were rumors swirling in Vienna (as is usual) that the group is zeroing in on a production cut of about 1 million barrels per day (mb/d). But the lack of an announcement on Thursday unnerved market traders. In fact, anything less would be viewed as a major disappointment. The markets are already pricing in 1 mb/d and hoping for more. “As ministers gather… the general belief is that some kind of cut will be agreed–anywhere between 1 and 1.5 million barrels a day,” said Tamas Varga, oil analyst at PVM brokerage, according to the Wall Street Journal. Related: Is This The Most Crucial Factor For Oil In 2019? The investment bank, Forex Live reports, acknowledged that the OPEC+ agreement to remove 1.2 million bpd from the global oil market beginning in January will have a positive effect in as much as it would calm worry about a looming oversupply, but this upside for prices will be limited. Morgan Stanley warned that the highs Brent and WTI enjoyed in October before they took a nosedive are hardly in the card for the next four quarters. Even so, Morgan Stanley saw the oil production cut as “likely sufficient to balance the market in 1H19 and prevent inventories from building”, according to a Reuters report. At the end of June 2019, the investment bank expects Brent to climb to US$67. 50 a barrel, versus an earlier forecast for US$77.50 a barrel. Bernstein Energy seems to agree with Morgan Stanley. Reuters quoted the brokerage as forecasting the average price per barrel of Brent crude next year to remain about US$70. “Our key conclusion is that oil prices will be well supported around the $70 per barrel level for 2019,” Bernstein said. Not everyone is optimistic, however. Reuters also quoted an Emirates NBD bank analyst as saying the cuts would not be enough to offset growing production from non-participants in the cuts. Edward Bell said he expected “a market surplus of around 1.2 million bpd in Q1 with the new production levels.” With the U.S. producing at a rate of 11. 7 million bpd and most indicators suggesting further increases, the oversupply scenario may well play out, sinking prices even lower. That should be close to enough to avoiding production impacts. “Takeaway capacity growth will therefore closely track output growth in the Permian, but it will still lag behind until the second half of 2019, when the 675 kb/d EPIC project comes online,” the IEA said. To be sure, the midstream challenges are not entirely resolve just yet. Pipeline “congestion at the Cushing hub should persist during 1H19, keeping pressure on WTI timespreads and differentials to Brent relatively wide,” Bank of America Merrill Lynch said in a note. Also, the margin is tight – the multiple pipeline projects slated for operation in 2019 need to stay on schedule, while the midstream sector needs to avoid any unexpected outage. “Operators can ill afford major pipeline or refinery shutdowns during that time, as this would only exacerbate the shortage,” the IEA cautioned. However, by the end of 2019, there will be very few midstream constraints holding back the shale industry. New planned export terminals will also clear the path for oil to be shipped overseas in ever rising volumes. 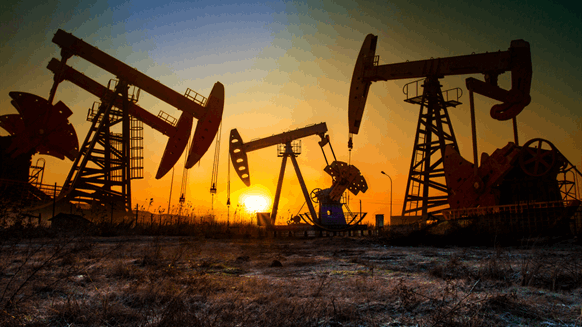 “[P]ipeline and export projects slated for completion by 2020 should unchain North American oil production growth early in the next decade,” Bank of America Merrill Lynch wrote. LONDON—Oil prices continued a steep slide early Tuesday, as concerns that slowing global growth could further hinder demand for crude outweighed production cuts by the Organization of the Petroleum Exporting Countries. Brent crude, the global oil benchmark, was down 3% at $57.80 a barrel on London’s Intercontinental Exchange. West Texas Intermediate futures, the U.S. standard, were down 3.3% at $48.24 a barrel on the New York Mercantile Exchange. Both benchmarks have fallen roughly 35% from four-year highs reached at the start of October and are at their lowest levels in more than a year. “The current price fall is greatly aided by the general fall in global equities due to persistent concerns about economic growth, including the U.S.-China trade dispute,” which has led to “fears of downward revisions in global oil demand growth,” according to Tamas Varga, analyst at brokerage PVM Oil Associates Ltd.
Prices are also being weighed down by signs of rising U.S. and Russian crude production. 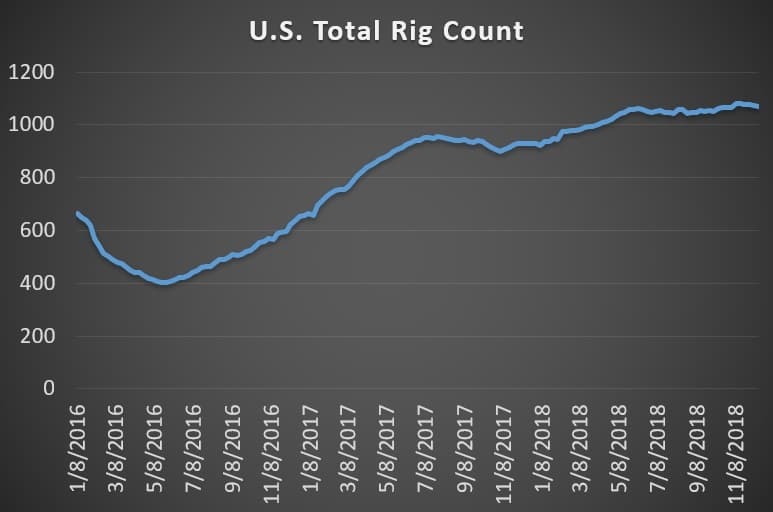 In its drilling productivity report Monday, the U.S. Energy Information Administration estimated that U.S. shale oil production would rise from December by 134,000 barrels a day to reach 8.17 million barrels a day in January. Russia, meanwhile, said its crude output had climbed to a record 11.42 million barrels a day in December. OPEC and its partners agreed at the start of December to begin curbing crude output by 1.2 million barrels a day, starting in January. 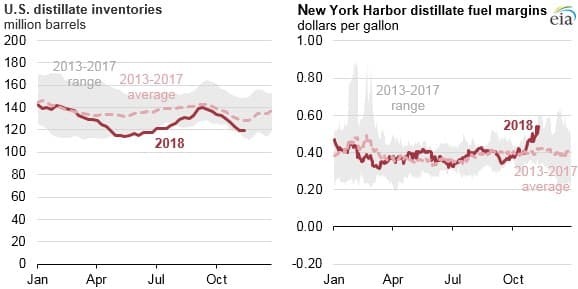 The deal, announced Dec. 7, had initially bolstered crude prices but failed to ignite a sustained rally amid skepticism by investors that the cut would be enough to rebalance an increasingly oversupplied oil market. Even with the planned OPEC-led cut, global oil inventories are expected to continue to build into 2019, said Michael Hewson, chief market analyst at brokerage CMC Markets. “Ultimately, it’s going to take a lot longer for that surplus to be worked off in the event that we do get a cut in the new year,” he said. The International Energy Agency last week said that commercial oil stocks in Organization for Economic Cooperation and Development countries rose by 5.7 million barrels in October, to stand at 2.872 billion barrels—marking the first time commercial petroleum inventories were above the closely watched five-year average since March. Analysts and investors are looking ahead Tuesday to weekly U.S. oil inventory data from the American Petroleum Institute. Rising global inventories are weighing on crude prices, pushing oil to one-year lows. 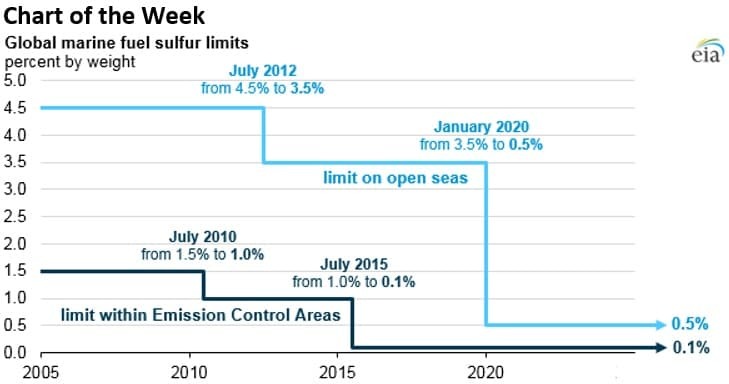 - Regulations from the International Maritime Organization (IMO) are set to take effect in January 2020, lowering the allowed limit of sulfur emissions from maritime fuels. - Sulfur concentration will drop from 3.5 percent on the open seas to just 0.5 percent. - These regulations will affect 3.9 million barrels per day of maritime fuels. The regulations will increase the demand for low-sulfur distillates at a time when demand is already high. • Crestwood Equity Partners (NYSE: CEQP) was upgraded to Buy from Neutral by Goldman Sachs, with a $43 per share price target. That came as EQT Midstream Partners (NYSE: EQM) was downgraded to Neutral from Buy. • BP (NYSE: BP) signed an agreement with Angola’s Sonangol for the development of its offshore Platina field, a step that pushes the British oil giant closer to a final investment decision. • Royal Dutch Shell (NYSE: RDS.A) is in talks to purchase Endeavor Energy Resources for $8 billion, or about half as much as Endeavor had hoped to sell for earlier this year, according to Bloomberg. ConocoPhillips backs carbon tax. ConocoPhillips (NYSE: COP) will reportedly join ExxonMobil (NYSE: XOM) in putting money into a lobbying effort backing a carbon tax. The oil majors have huge stakes in natural gas, which stands to benefit from a light carbon tax. New discoveries up in 2018. The oil and gas industry is expected to log the largest set of new discoveries this year since 2015. Discovered resources stand at about 8.8 billion barrels of oil equivalent, and could close out the year at about 9.4 billion boe, according to Rystad Energy. “We at Rystad expect this discovery trend to continue into 2019 with many promising high-impact wells targeting vast potential,” Palzor Shenga, senior analyst on Rystad Energy’s Upstream team, said in a statement. Oilfield services look to rebound. Offshore oilfield services and contractors have seen four consecutive years of declining revenues, but could bounce back in 2019. More than 100 projects could move forward in 2019, and an estimated $210 billion could be spent on offshore oilfield services next year, according to Rystad Energy. “The offshore service market is like a super tanker: It takes time to accelerate. The uptick in new projects in 2017, 2018 and now 2019 will be enough to turn revenue growth positive to mid-single digits as offshore capex is set to increase due to the recent years of capital commitments,” Audun Martinsen, head of oilfield service research at Rystad Energy, said in a statement. Successful offshore wind bidding. The U.S. government held a highly successful bidding round for offshore wind projects off the coast of Massachusetts last week. The winning leases could support 4.1 gigawatts of wind, and the auction took in $405 million in winning bids. The winners were Equinor Wind US; Mayflower Wind Energy, LLC, a 50-50 joint venture between Shell and EDP Renewables; and Vineyard Wind, LLC, a 50-50 joint venture between Copenhagen Infrastructure Partners and Avangrid Renewables, according to Greentech Media. ExxonMobil becomes top Permian driller. ExxonMobil (NYSE: XOM) was late to the game but now has the most drilling rigs in the Permian basin. The development highlights the lure of the Permian as well as the shale-focused strategies deployed by the oil majors. European Union agreed to cut carbon emissions from cars. The EU agreed to a goal of cutting carbon emissions from cars by 37.5 percent within a decade, with an interim target of 15 percent by 2025. Germany’s auto manufacturers opposed strict requirements and warned that the new goals do little to provide incentives for the switch to electric cars. Officials from Iraq, Kuwait and the United Arab Emirates agreed with Saudi Arabia’s expectation that the group, along with Russia and other oil producers, will extend the agreement for another six months. The U.A.E.’s energy minister, while stressing that the 1.2-million barrel-a-day cut will clear an inventory buildup in the first half, hinted additional curbs could be discussed. Last week, oil capped its biggest weekly decline since 2016 on concerns that weakening economic growth and surging U.S. supply will lead to a surplus next year, overwhelming OPEC’s efforts to stabilize the market. The slide continued even after the Organization of Petroleum Exporting Countries and its partners surprised traders with the size of the supply reduction announced on Dec. 7. Futures sank 11 percent last week in New York, the most since January 2016. The benchmark Brent crude traded below $54 a barrel, the lowest since September 2017. At a press briefing in Kuwait, Iraqi, the U.A.E. and Algerian energy ministers took turns repeating the message that OPEC will deliver its 800,000 barrels per day cut and continue their cooperation with other producers to balance supply and demand. Thamir Abbas Al Ghadhban, center, on Dec. 6. 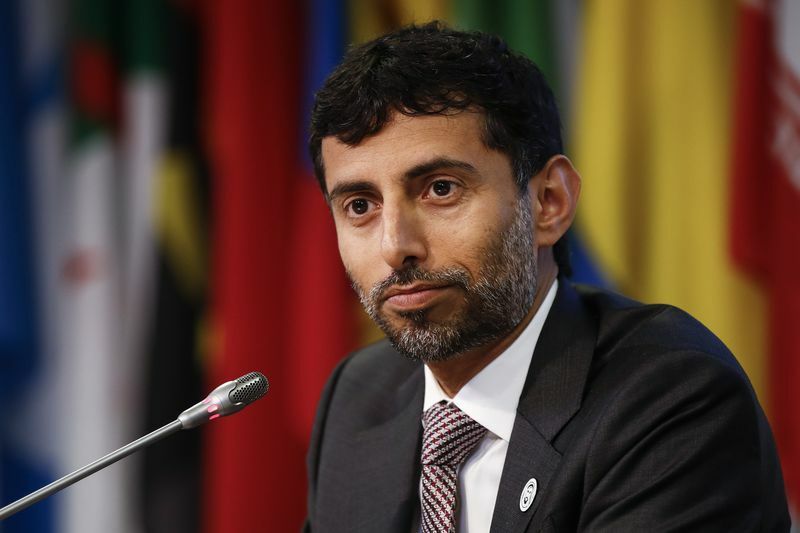 OPEC cuts may end up being deeper than agreed because of planned maintenance and production snags in some member countries, Al Mazrouei said. Conflict, sanctions and aging oil fields have been factors that dragged on output in Libya, Nigeria, Iran and Venezuela in recent years. Although the oil market will remain oversupplied in the first quarter of 2019, the OPEC+ producer cuts will start to work in the second quarter and gradually rebalance the market to the point of Brent Crude hitting $80 a barrel in Q4 2019, according to energy information provider Argus Media. The market needs time to work through the current oversupply, Azlin Ahmad, editor for crude oil at Argus Media, told CNBC on Monday. The OPEC+ combined production cut of 1.2 million bpd takes effect in January 2019 for an initial six-month period, with a possible review in April. According to Argus Media, Brent Crude prices will trade at around $65 a barrel in Q1, some $68 in Q2, in the low $70s in Q3, and breaking above $80 per barrel in the fourth quarter next year, according to Ahmad. On Monday afternoon at 01:30 p.m. EST, Brent Crude was down 4.42 percent at $51.71, and WTI Crude was trading down 4.41 percent at $43.58, as concerns about slowing economic and oil demand growth persist. While some banks have drastically cut their oil price forecasts for next year, Swiss bank UBS expects Brent Crude to rebound to $70 and even $80 a barrel over the next 12 months. The head of asset allocation for APAC at UBS, Adrian Zuercher, told CNBC last week that while supply of crude oil was still abundant, this could soon change as the OPEC+ production cuts enter into effect. While the recent oil price drop suggests many don’t believe these cuts will be as effective as the first ones in 2017, Zuercher noted a report by the Wall Street Journal that Saudi Arabia plans to cut more than initially expected, and the fact that Venezuela’s production would likely continue downwards as would Iran’s under the weight of U.S. sanctions. The PPT got a one day bounce for $80B in new debt money. Now back to the regularly scheduled CRASH. Oil prices fall about 3 percent after rebounding 8 percent in the previous session. Brent crude oil was down $1.70, or 3.1 percent, at $52.77 a barrel by 12:25 p.m. ET. U.S. light crude oil was $1.24 lower at $44.98, a loss of 2.7 percent. For much of 2018, investors probably thought they had a strong bet in the energy complex. But that bet badly turned sour in the final 60 days of the year. The spot energy index in the S&P Goldman Sachs Commodity Index (GSCI) gained 25 percent between January and October. But with the books closed on 2018, the index ended the year down 21 percent. The S&P GSCI “is a weighted average of commodity prices intended to reflect global commodity production quantities and futures contracts’ trading volumes,” according to the EIA. Energy was not the only commodities sub-sector in the GSCI index posting losses in 2018, just the worst-performing one. Of course, that is largely just a reflection of the sharp decline in oil prices. But the share prices of most oil and gas companies are also largely based on oil price movements. So, the steep slide in oil prices in the final two months of 2018 led to disaster for investors in energy stocks. “The stock market went to hell in December. And when it got there, it found that the energy sector had already moved in, signed a lease and decorated the place,” Tom Sanzillo, Director of Finance at the Institute for Energy Economics and Financial Analysis (IEEFA), wrote in a commentary. The energy sector was at or near the bottom of the S&P 500 for the second year in a row, Sanzillo pointed out. And that was true even within segments of the oil and gas industry. For instance, companies specializing in hydraulic fracturing fell by 30 percent, while oil and gas supply companies lost 40 percent. “The fracking boom has produced a lot of oil and gas, but not much profit,” Sanzillo argued. Looking forward, there are even larger hurdles, especially in the medium- to long-term. Oil demand growth is flat in developed countries and slowing beginning to slow in China and elsewhere. The EV revolution is just getting started. The last great hope for the oil industry is to pile into petrochemicals, as oil demand for transportation is headed for a peak. But profits in that sector could also prove elusive. “The industry’s rush to invest in petrochemicals to maintain demand for oil and gas is likely to continue, but the profit potential in this sector is more limited than oil and gas exploration, and is likely to keep the energy sector at or near the bottom of the S&P 500,” Sanzillo concluded. Meanwhile, the Wall Street Journal reports that the U.S. shale industry has been over-hyping the production potential from their wells. The WSJ compared well-productivity estimates from shale companies to those from third parties. After looking at the production data at thousands of wells and how much oil and gas those wells were on track to produce over the course of their lifespans, the WSJ found that company forecasts seemed to be misleading. Schlumberger, for instance, has reported that secondary shale wells near older wells in West Texas have been 30 percent less productive than the initial wells, the WSJ found. Also, many shale companies used data from their best wells and extrapolated forward, projecting enormous growth numbers that have not panned out. The upshot is that shale companies will have to step up spending in order to hit the promised production targets. However, so many of them have struggled to turn a profit, and the recent downturn in oil prices has put even more pressure on them to rein in costs. That raises questions about the production potential not just from individual shale companies, but also from the U.S. as a whole. ️ What’s Behind Oil’s Slow Flash Crash?